The house of Lubin has slowly but surely been undergoing a spectacular renaissance, after over two centuries of existence (it was founded in 1798) and a couple of decades in the limbo reserved to zombie brands. In fact, its owner Gilles Thévenin, rescued it just before the German company Mülhens (of 4711 fame) decided to close it down. Fortunately, Mülhens, itself a 200 year-old company, had preserved Lubin’s two centuries of archives. Gilles Thévenin is thus in possession of most of the venerable French house’s formulas – and there are over 450. But he has no intention, he says, of becoming an “archaeological brand”. Whatever he chooses to re-issue must be “relevant today”: the re-formulations, produced in conformity with current regulations, and with the materials available today, don’t necessarily smell exactly like the originals, but they must, he states, “be created with the same sincerity and the same balance” as their models. 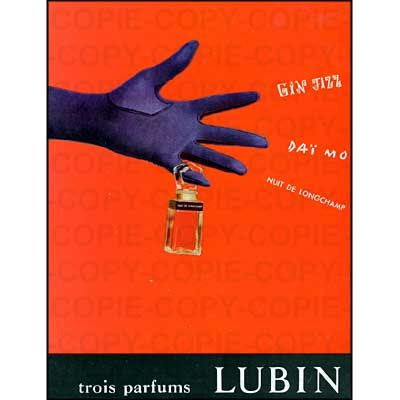 Lubin’s new owner describes himself as “obsessed with fragrance” from his earliest days, back when his mother came back from Paris shopping expeditions to Balenciaga and Courrèges with fresh supplies of Mitsouko. 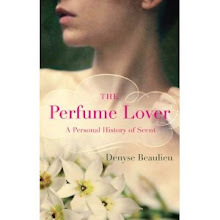 The first girls he followed in the street, he recounts, he followed “because of their perfume”. He dreamed of working for Guerlain: and he did (Jean-Paul Guerlain is still a close friend). It was when he moved on to Rochas that he first started considering taking over the house of Lubin: like Rochas, it belonged to the German Wella group via Mülhens. It took Thévenin several years to acquire what had by then become a zombie brand. He sold everything he owned to buy and re-launch it, and when he did, it was with a coup d’éclat: a brand new fragrance composed by his friend, the supremely talented Olivia Giacobetti, housed in a bottle designed by the legendary Serge Mansau. The spice-laden woody composition inspired by Gilles Thévenin’s reminiscences of traipsing around the China Sea while he was based in Java – Giacobetti, saying “don’t forget the pirates”, playfully added a rum note. Idole created quite a buzz in the fragrance world, not least because with it, Giacobetti seemed to have strayed from her trademark ethereal style in favor of a more robust approach. So far, of the five fragrances produced since the rebirth of Lubin, three are re-launches (Eau Neuve, Nuit de Longchamp and L), and two new compositions (Idole and Vétiver). Thévenin’s desk is strewn with several atomizers containing mods for current projects: the next in line is the 1955 Gin Fizz, composed by Henri Giboulet (who went on to succeed Henri Alméras at Jean Patou), assisted by Jeannine Mongin, one of the founders of the Versailles Osmothèque, whose advice Thévenin sought out when he decided to re-issue the fragrance. The new Gin Fizz, an aldehydic, hesperidic chypre, will have the clean, Technicolor brightness that inspired Giboulet when he dedicated it to Grace Kelly. “But we’ve undressed it of its retro feel and dressed it up again”, explains Thévenin. It will come out next Spring. For Gilles Thévenin is a man who seems to love nothing more than a good chypre: they are the quintessence of perfume, he says. In fact, his two 2008 releases are both chypres: a floral, the 1934 Nuit de Longchamp, and a fruity, the 1974 L de Lubin. Though partially reformulated, both seem pretty close to the originals: clearly, a lot of work and thought has been put into making them feel authentic. By now, we all know the reasons for reformulations: cheapening the formula, replacing ingredients that are no longer available or affordable, applying the “safety principle” by conforming to regulations on allergenic or toxic materials, or just plain trying to make to fragrance more appealing to mainstream modern tastes. In the case of Lubin, the first reason (making the formula cheaper) doesn’t apply: on the contrary, the whole point has been to bring quality back to a brand that had been slowly decaying. Reasons two and three couldn’t be helped: many bases are no longer manufactured and some raw materials (namely musks, citruses and oak moss) are either prohibited or regulated. Another reason for reformulating an old classic may be that because of the extensive use of bases, many ingredients were repeated several times (they were present in several bases): the formula can be comfortably shortened without affecting the scent itself. However, there have been, by Gilles Thévenin’s own admission, some modifications brought to Nuit de Longchamp (and to the next re-launch, Gin Fizz) to give it a more modern feel. 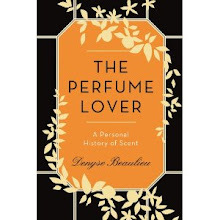 This was a purely marketing decision, though not a callous, uninformed one: Lucien Ferrero of Expressions Parfumées, the author of L de Lubin, worked on the new formula for at least a year, along with Henri Bergia. Agree with Alyssa; am eagerly awaiting part 2. ScentScelf, I'm working on it... As well as part 3, L de Lubin! I hope Gin Fizz will be divine, because I would love to wear a perfume named Gin Fizz. . .